Hosted by SheJumps. Event is FREE. RSVP on Eventbrite. 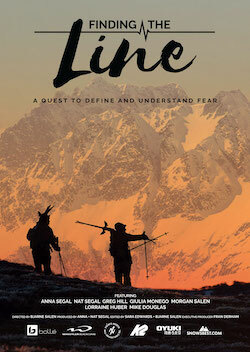 FINDING THE LINE is a film about fear, it’s paralyzing grip on humans and how it affects our decision-making. In this feature length documentary, Olympian and X Games Slopestyle champion Anna Segal and her Freeride World Tour, big mountain skiing sister, Nat Segal, use their skiing to understand fear and how it manifests in the two siblings’ lives. Throughout their careers as professional skiers, Anna and Nat have both constantly been challenged by fear. Yet, despite being brought up under the same roof, they have learned to deal with it in almost contrasting ways, neither leading them to the success they dreamed of. A heartfelt journey on the knife’s edge of big mountains throughout Canada and France pushes them to their physical and emotional limits. The extreme skiing mecca of Alaska pushes them beyond. The Australian sisters soon realize that the most important lessons lie within each other’s approach. Equipped with greater insight, they negotiate the fine balance between staying in their comfort zone and taking too much risk, learning that sometimes to move forward, you need to understand what is holding you back. Hosted by SheJumps, an organization that increases the participation of women and girls in outdoor activities to foster confidence, leadership, and connection to nature and community through free and low-cost outdoor education.